At Neophyte farms our birthday parties are fun and educational. 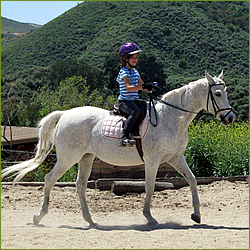 You and your guest will get to learn how to groom and saddle your horses. Everyone will learn the basics of riding and then we play games on horse back. Our parties are held at our ranch located in Simi Valley. We have a picnic area for cake and non riding guest to watch. Our parties start at $300 for 3 hours of party time. This includes up to four riding guest. Each additional riding guest is $20.